Sources at al-Qassam said a group of al-Qassam fighters managed to shoot Israeli special forces who was walking around the car market. The al-Qassam fighters managed to penetrate and get to the troops. 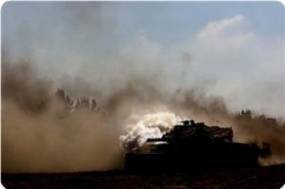 In the military statement, al-Qassam source added, al-Qassam fighters successfully detonates bombs "Shawaz 4" at an Israeli tank type "Merkava 4". Tank type is a pride for the Israeli army and has the world's most advanced protection. This tank was completely destroyed in the attack succeeded in this. The al-Qassam fighters also set off another bomb at a military patrol in the same area. While the bomb when the infantry. This source continued that after bombs blast resistance fighters senjara releasing a barrage of automatic gunfire and RPG rockets towards Israeli forces before withdrawing from the site and returned to base safely. The fighters mamastikan deaths and injuries occur in the Israeli military. Witnesses said they heard explosions caused by bombs and saw white smoke billowing from an Israeli tank that was followed by a puff of black smoke. They say it proves that the fire has devoured the tank. After that followed a massive fire attack. Israeli warplanes rushed into the area and fired sweep. Since yesterday evening to Wednesday morning continued clashes between Palestinian resistance fighters to the Israeli forces are concentrated in some corner of the Gaza Strip.